After significant weight loss or gastric bypass surgery, one is often left with excess skin on the lower body. The inner and outer thighs may exhibit redundant skin and tissue that causes discomfort and detracts from the beneficial aspects of weight loss. To truly appreciate your new body and realize the benefits of weight loss, you may need to undergo a body contouring procedure specifically designed to remove excess, hanging skin and tighten and tone, such as a thigh lift or arm lift. Who Should Undergo a Body Lift? A thigh lift reshapes the contour of the inner and/or outer thighs by removing excess skin and in some cases, removing a limited amount of fat with liposuction. A lower body lift may include skin removal and tightening on the thighs, but also on the buttocks and hips. In some cases, a tummy tuck should be performed as well. Incisions are made in natural body folds, in areas that allow surgery scars to remain concealed. Dr. Branman lifts, tightens, and removes skin in a concentric pattern around the body and legs. The remaining skin is draped over the body with a smoother, more taut appearance. Sutures are placed to maintain the new form and close the incisions. After a thigh lift or lower body lift, some bruising and swelling should be expected. Compression garments are provided and worn to control swelling and ensure a smoother result. Drains may also be placed to evacuate fluids that accumulate during recovery. Patients should be able to return to their normal routine after 4-5 weeks. To learn more about lower body procedures such as the thigh lift or lower body lift, contact the cosmetic surgery office of Dr. Branman. 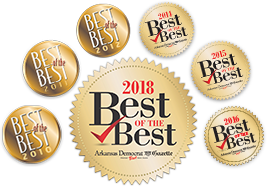 Body lift surgery, and all cosmetic surgery procedures, are performed by Little Rock cosmetic surgeon Dr. Rhys Branman at Arkansas Surgical Hospital.